Mr Brekk indicated that “Japan has actually been a bright spot in the global economy over the last couple of years” and had “grown above potential for … more than two years now”. He said this growth was due to “external demand as well as some more fiscal stimulus than we expected”. 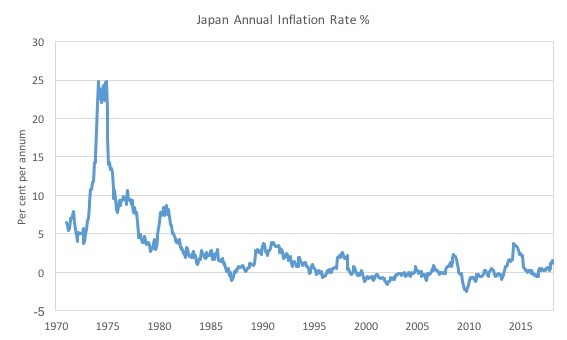 In terms of inflation – he noted “the gradual increase that we have been seeing in inflation over the last year or so” and that “you have to realize this was never going to be a sprint given Japan’s decades long stagnation, but rather a sustained effort to change mindsets and practices”. In other words, the IMF was urging the Bank of Japan to continue to maintain its huge “monetary stimulus” in order to increase the inflation rate, which is languishing at around half the Bank’s stated target. Moving fully to the yield curve control framework would help strengthen the message that you can sustain and that you will sustain an accommodative monetary stance. The reference to “moving fully” is in the context of the bank stating that it will continue to increase its Japanese government bond holdings annually by around 80 trillion yen, when in fact, in the recent past the purchasing rate has been around 50 trillion yen. … worry about the sustainability of the BOJ’s policies given the 2 percent inflation target remains distant and the size of its balance sheet is approaching that of the nation’s annual economic output. 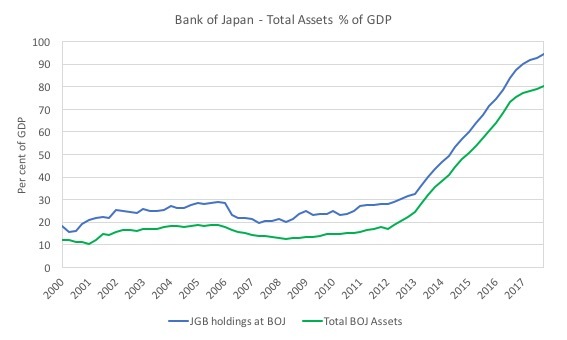 The relevant graph that follows is the Total assets held by the Bank of Japan as a per cent of GDP (blue line) and the proportion held as Japanese Government Bonds between the March-quarter 2000 to the December-quarter 2017. In the December-quarter 2017, total assets stood at 94.5 per cent of GDP (and JGB holdings were 80.2 per cent of GDP). 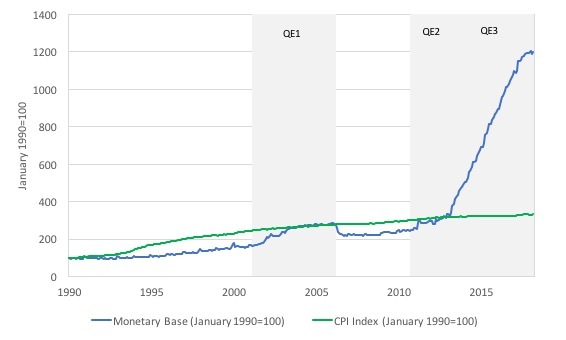 The point of this blog post is to emphasise that it doesn’t matter one iota and that it rapid acceleration since the Bank of Japan started buying JGBs in large volumes in order to increase the inflation rate demonstrates how ineffective monetary policy is in influencing the path of the inflation rate, despite the massive increase in central bank assets. 1. All items rose by 1.1 per cent annually but was down 0.4 per cent on the month to March 2018. 2. 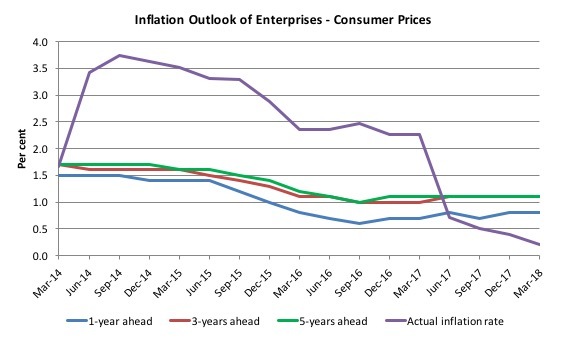 Excluding the volatile items (fresh food and energy) the annual inflation rate was only 0.5 per cent and the monthly fall was 0.1 per cent. In other words, the annual inflation rate is still around 50 per cent of the Bank of Japan’s stated target. It CPI index hasn’t changed much since the mid-1990s. A long way to go in other words. The following graph shows the history of Japanese inflation since 1970. The graph shows the evolution of these indexes up to March 2018. The monetary base index was at 1200.5 in March 2018, while the CPI was at 332.7. New Keynesian suggest that prices are adjusted to accord with expected inflation. With rational expectations, the mainstream models predict that inflation will respond one-for-one with shifts in expected inflation. While the Bank of Japan can accumulate JGBs in whatever volumes they choose and can never go broke if the price of those bonds in the secondary markets create “losses”, the policy will not deliver the inflationary spike that the IMF and the Bank is seeking. 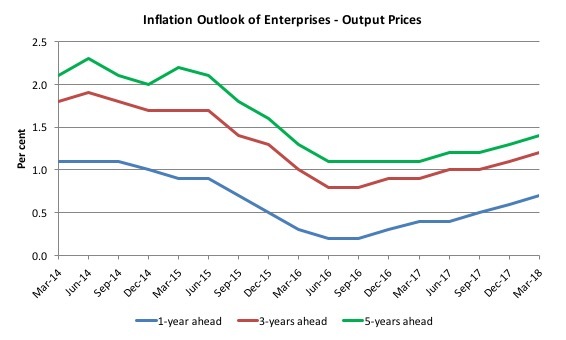 Inflation will accelerate if fiscal policy pushed the growth rate and the demand for real resources above the potential growth rate and the resource availability. It’s amazing how long a belief can sustain itself. The Olympics in London came at a fortuitous time and the Olympics in Japan similarly. The Special Advisor to the Japanese Cabinet, Prof. emeritus Koichi Hamada of Yale University, two days ago gave an interview in the Nikkei Daily Newspaper, the largest business daily in the world, forecasting that the BoJ will soon look into the possibility of buying foreign bonds to boost QE. This possibility has been alluded to several times in the recent past in the same (in Japan most influential) newspaper suggesting that the BoJ may actually take that step fairly soon. My question does not concern the effectiveness of this operation. I wonder what it does to the balance sheets of the involved parties and if it is possible that a government creates domestic currency in order to buy foreign assets. What is the effect? How large are the monetized part of the BoJ holdings(JB´s)? I mean the portion of new debt that been bought instantly by BoJ? I guess it accelerated from QE2! Has my question any relevance at all? For every “old” bond that is bought by BoJ there is “room for another one to be issued”(c.p.)! Should anyone be even worried at all by inflation being below 2%? So long as indicators of the real economy – such as employment levels – are satisfactory. And if employment is too low (unemployment is too high), then they should push fiscal stimulus, with the only “danger” being that inflation might rise – but this is supposed to be what they are trying to achieve in the first place. I actually said 10 years ago that Japan(BoJ) could or might “kill” it´s bonds in the end. The slow death at BoJ. You have to buy foreign currency first since the bonds are not denominated in Yen. So if you are issuing currency to buy foreign currency you are operating a mercantile export process designed to weaken your currency against your counterparts. Which is what all net exporters do eventually if they want to continue net exporting. Which means you don’t need to pay interest on bonds – particularly to foreign investors. They are desperate for them anyway. Please correct me if I am terribly wrong here. How can a sovereign nation get foreign currency? 2. Borrowing foreign currency by the treasury, cb or the private sector. 3. Buying foreign currency against its domestic currency(if there is demand). 3. Using cash at hand or what is created out of thin air but also to some extent by market operations(i.e forwarding or other derivative-contracts). I agree with Mr Wilson! Another tool in the box! Hi Bill, apologies if this sounds crazy and off-the-wall, but have you ever considered the possibility that they have known that all along, and that the 2% inflation target may have been introduced for political, not economic reasons? The origin of the change from a 1% target to a 2% target was the political comeback of Shinzo Abe in 2012, and the marketing and re-branding of him as a politician with a vision for the economy and a willingness to take action. It was also used as a pretext to replace the “timid” Shirakawa (who said the 2% target was not achievable) as head of the BOJ and put the Ministry of Finance man Kuroda (who said it was) into the position. Kuroda has since spent the last 5 years not hitting the target, but claiming he will “soon” over and over. It’s like he knew all along he wouldn’t, and the plan was to just keep denying that he wouldn’t. Meanwhile, the two real political objectives were accomplished successfully. When the IMF talks about moving fully to YCC they are talking about abandoning the 80 trl yen quantity target that is necessarily obsolete. They are not talking about achieving both the rate and quantity target – not even the IMF could get that wrong! A fully implemented YCC policy does not have any sustainability issues re. bond scarcity. As convincing as MMT sounds in most aspects it seems that it cannot explain why a government could not use its domestic currency in order to purchase foreign assets – in the case of Japan the BoJ buying foreign bonds, etc. – maybe even other foreign assets. A currency-issuing government can clearly buy “foreign assets” as long as it can find a counter-party in the foreign exchange markets to swap its currency for the relevant foreign currency. I don’t recommend that it do that. But it can. Thank you very much for taking the time to address my question although you have a public holiday in Australia. I am writing from the opposite part of the world (Switzerland). Above I was referring to the fact that the most influential business daily in Japan, the Nikkei Newspaper (btw. it also owns the FT), recently featured several articles hinting that the BoJ may soon start buying foreign bonds as part of its QE. To me this sounds as if a government could (theoretically in huge quantities) creat new domestic funds and purchase foreign asset (the purchase of the foreign currency is no problem; every central bank has a specialized desk for that), the effect being 1) the creation of further reserves in the domestic currency, 2) welcome downward pressure on the domestic currency and 3) foreign assets free of charge. Apologies for this simple thinking, but I honestly “spread the word” and would like get more skilled to do that. Once there was the system with fixed currency-regimes. Nowadays every exportnation competes by depreciating their currency. Some day the action-reaction processes will come-back in a Minsky-way. Will MMT be here in time? Probably not. Wouldn’t the sort of currency action about which you are asking generate the sort of international hostility that currently greets “competitive devaluation”? Presumably there would be suitable forms of retaliation once the operation were known and understood. Non-economist: That’s an odd question coming from Switzerland. Last I checked, Switzerland has accumulated the third largest foreign exchange reserves in the world, after China and Japan, much bigger countries. This is due to people sensibly fleeing the euro and the Swiss central bank responding by keeping the franc down for a long time, to support export industries, by purchasing foreign currencies as you mention. Due to popular pressure, the franc was more recently allowed to float up. George Soros nearly lost his shirt betting the wrong way, unwinding his positions just in time. Finding a counterparty would be the trick. They could also (2) create enough money to buy as many foreign-denominated bonds as a counterparty would sell them. This would amount to scheme 1, but handing the purchasing power, including the right to use it, to foreigners in exchange for printed pieces of paper shaped like bonds. If the BoJ bought enough bonds, the foreigners could buy Mt. Fuji, or anything else for sale in Japan, with — whatever — social consequences. We see this kind of thing in action in the housing bubble/crisis in the U.S., where median earners in the big cities can’t afford to live there because of rent or purchase prices. They’ve been outbid by investment money. This is what Modern Money can do when the people who control it use it for the wrong things. I’m sorry that George Soros only “nearly” lost his shirt. Mel: What would the foreigners buy with their JPY? JP real estate, equities, machinery? All this would help the BoJ reach its declared target. Sounds like a good idea to me. At least so thinks Mr. Hamada, advisor to the JP government. Honestly, I’m not clear on what the target is, and what the benefits of hitting the target would be. I wonder not if but when the mighty dollar again will start its rise! Another modern Plaza Accord followed by a stockmarket-crash(think 1987)? History always repeats they say………man never learns! Perhaps it is unavoidable due to market cycles(aka human behavior). Non-economist: They would likely buy nothing and hold the JPY as an asset, betting that favourable exchange rates would make them a profit. As always a great post. Q.E is clearly not as effective as central bankers like to make out although I do not agree with you that central bank insolvency “doesn’t matter”. If the central bank is technically insolvent then it’s not the end of the world – it can rebuild it’s capital position organically over time while issuing reserves to meet liabilities as they fall due. However it does matter to the conduct of monetary policy. If a central bank wants to tighten policy it needs to sell assets to reduce the level of reserves in the system – which it cannot do if it is technically insolvent. Admittedly this would be a rare scenario and a number of central banks have operated while insolvent (e.g. Chile), but I think your statement does not reflect the truth.